Majestic Meteora is the most beautiful part of Greece. An awe-inspiring UNESCO Heritage Site area, filled with incredible rock formations and centuries old monasteries. Check out some stunning landscape and monasteries in these Meteora photos, and discover how easy it is to explore this unique Greek treasure. There is something magical and unreal about Meteora. Visitors can't help but to be impressed and even slightly humbled by the spectacle all around them. Weirdly unique rock formations force their way out of the ground. Monasteries sit perched on top of improbable peaks, and the feeling at sunset is out of this world. In my opinion, Meteora is one of the best places to visit in Greece. Although I had visited Meteora once before, I was recently invited by Meteora Thrones to visit Meteora along with other friends from Travel Bloggers Greece. During our weekend trip, we would get to experience three tours. The Meteora photos for this article were taken during the morning tour. It goes without saying that all views are my own – You should know by now I don't BS people! The half-day, morning tour of Meteora offered by Meteora Thrones, is a comprehensive tour of the area which takes in all the main highlights. The tour started when the air-con limo mini-bus picked us up from the hotel. Over the course of the next four hours, we would then be driven to all of the monasteries, 3 of which we also visited inside. With commentary from a knowledgeable local guide, this was an excellent way to explore majestic Meteora. Now, it's at this point that I could bore you rigid with lots of facts and figures about Meteora. 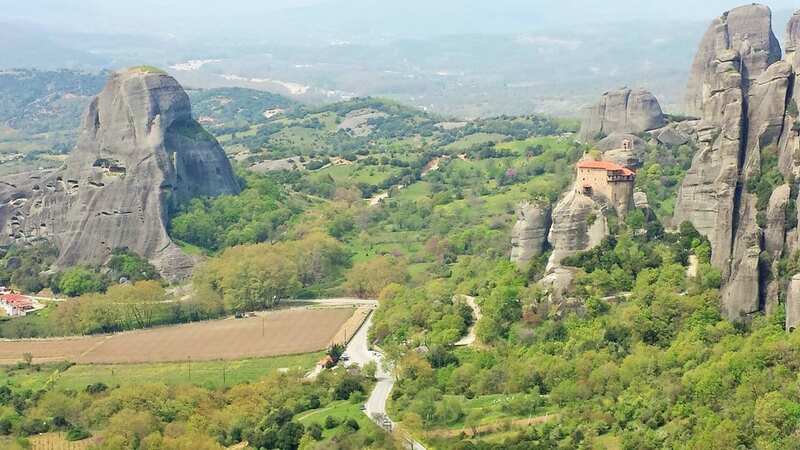 Did you know that there were originally 24 monasteries in Meteora, but now only 6 are inhabited? Did you know that two of the monasteries are actually convents/nunneries? Let's be honest though, you are just interested in the photos of Meteora, right? I don't blame you! Normally I am one for absorbing facts and figures, but this stunning landscape made all that seem very insignificant. 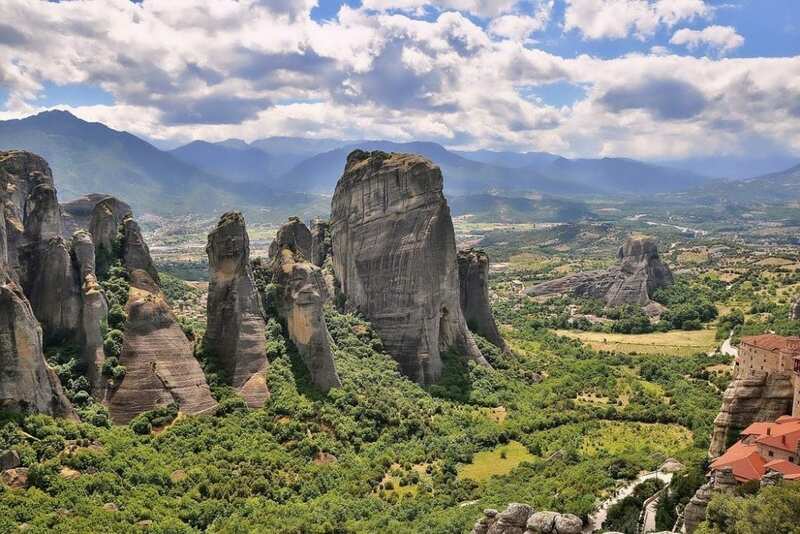 It's not hard to see why Meteora is one of the most visited parts of Greece. 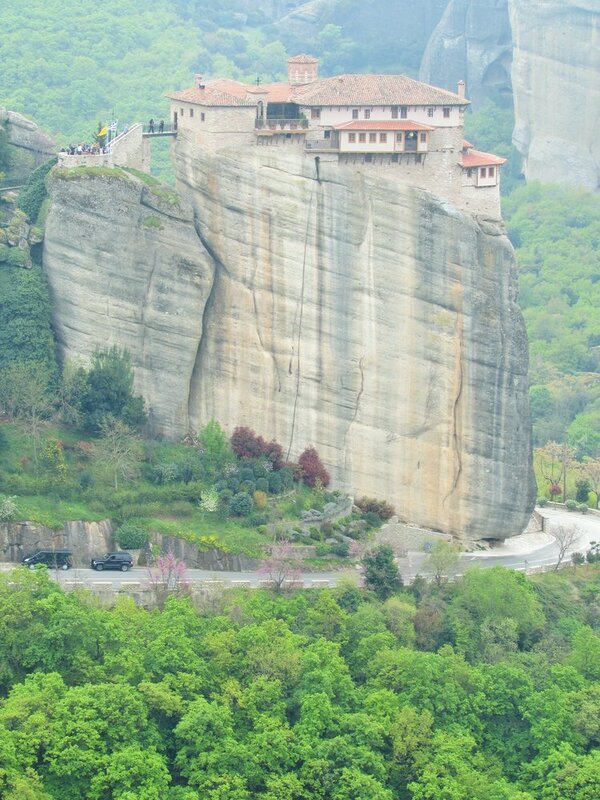 There are not many monks left inside the Meteora monasteries nowadays. With nearly 3000 tourists a day, it is hardly a place for quiet contemplation! The ones that are left can sometimes be spotted overseeing the visitors with a concerned, and often bemused expression. Our local guide was essential in pointing out the best spots to take photos of Meteora at different times of day. If you are considering visiting Meteora on a day trip from Athens, or are thinking of spending just one day there, I strongly suggest taking the tour. It is going to save you a lot of time and hassle, besides which, it is extremely affordable. Just 25 Euros when we visited in April 2016! 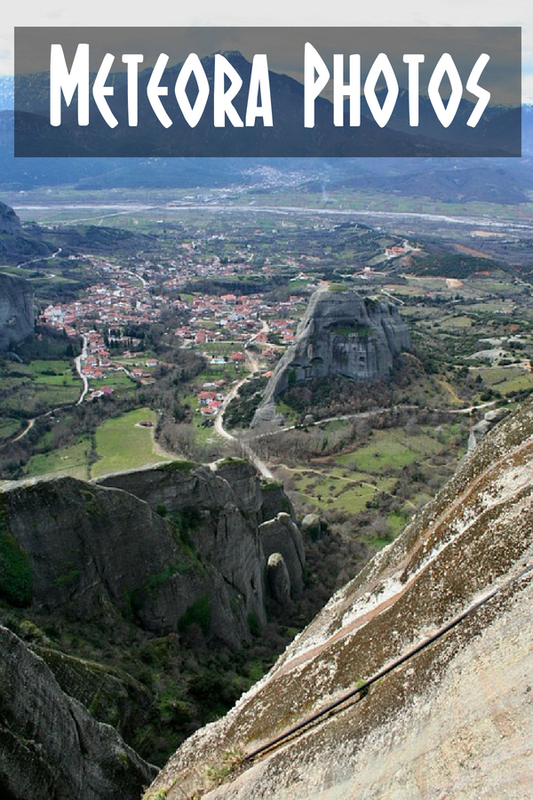 Here is some information you may find useful if planning to visit Meteora. Where is Meteora? Meteora is situated in Thessaly, in the middle of Northern Greece. The closest town is Kalambaka. How Do I Get To Meteora? – The gateway town of Kalambaka is well connected via both road and train. By car, it takes about 4.5 hours from Athens, and 2.5 hours from Thessaloniki. Meteora Thrones also offer transport services. More at How to get from Athens to Meteora. 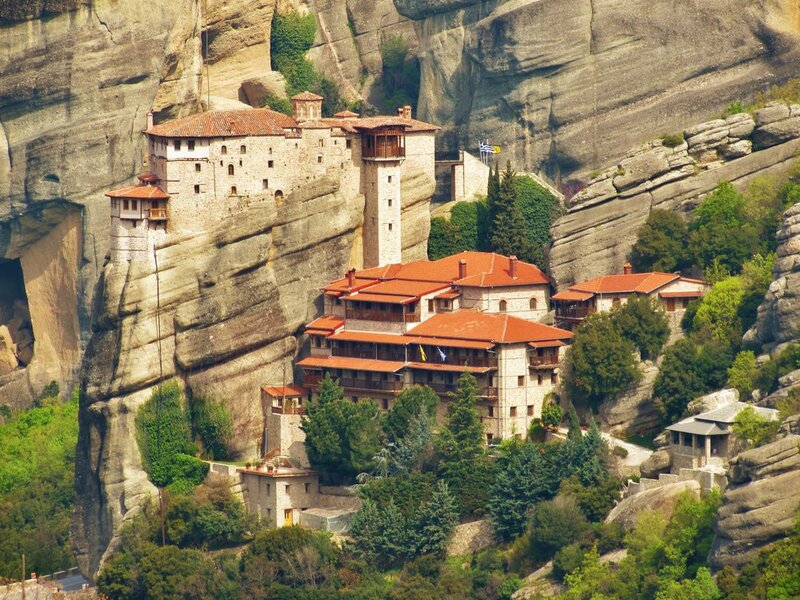 Where Is There To Stay in Meteora? – Kalambaka has a wide range of accommodation to choose from. We stayed at Hotel Famissi for the weekend, which was a well run establishment. 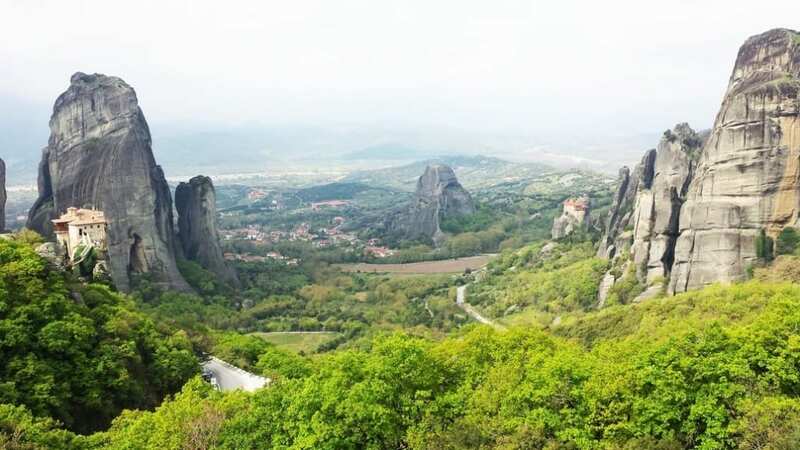 You can also check out this blog post about the best places to stay near in Kalambaka, Meteora. Where is there to eat in Meteora? – Again, plenty of places to choose from. My favourite was Restaurant Meteora, which I have to say I might not have tried if travelling by myself, as I assumed it looked ‘too touristy'. So glad I did though, as the food was amazing! I hope you enjoyed this blog post about majestic Meteora. I have another two posts to write, and so you can expect some more Meteora photos over the next week or two. Have you visited Meteora, or would you like to ask a question about the area? Please leave a comment below. Meteora At Sunset – The most spectacular place on earth?